The Queen fruit machine is the classic rock themed £100 jackpot AWP from Bell Fruit Gaming. Using visuals from the famous rock band Queen, the fruit machine brings an entertaining visual experience but offers nothing new in terms of gameplay. Borrowing heavily from Deal or No Deals’ The Big One, the Queen fruit machine has a Deal or No Deal style bonus game, with £100 as the top prize as well as a progressive cashpot that can offer up to £100 plus a repeat chance for a maximum award of £200. The Queen fruit machine has three reels, with three Freddie Mercury symbols anywhere in view opening up the game board. The main game board offers the standard Bell Fruit awards, with progressive cash and feature ladders. Although you are unlikely to reach the top, the maximum values on these ladders are the jackpot. As you progress around the board, Radio GaGa may broadcast you a message, press the button to listen to some helpful advice. The main, and most entertaining way of hitting the jackpot is through the Queen fruit machine super game. Pretty much everyone will know how this works, simply accept or decline an offer as the awards are slowly eliminated. Three Queen logos will open up the super game, with a further two eliminating the lowest quarter of the awards, and a further one eliminating another 25%. This will then leave only the golden side of the awards available, vastly increasing your offers, and the chances of getting either the cashpot or the jackpot. 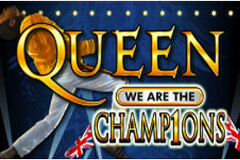 The main reason to play the Queen fruit machine is of course for the jackpot or cashpot, although there are many other cash and feature prizes available. The music is also entertaining, with We are the Champions the jackpot theme. Be warned that the cost of features can be excessive, occasionally up to £19, and that offers no guarantee of anything of any value.